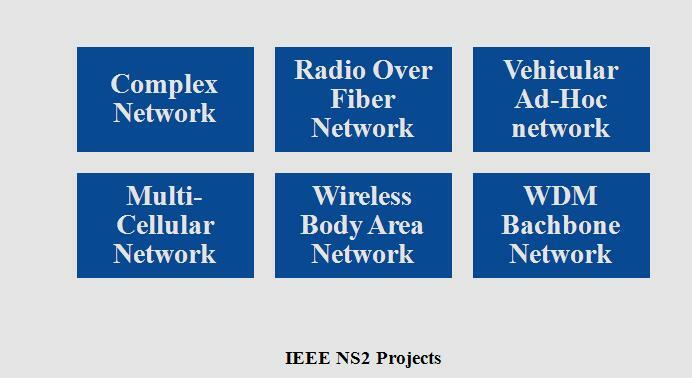 IEEE NS2 Projects need to built the network ideas.We can easily get the all simulation results.IEEE is an International standard which ensure qualified IEEE paper, products and projects for society communication. WE offer more number of IEEE NS2 Projects for final year background of ECE, CES, and Information Technology student’s different domain such as computer, distributed network, parallel network, mobile computing, data communication and network are implemented by us in NS2 projects. By using an NS2 simulation we can easily do the process such as creating node, Transformation of packet, establishing link, queue management and scheduling of packets. We offer and support Ns2 based IEEE projects for M.Phil, PhD and MS and post graduate students. To combine different graphs in network, we deploy complex network in Ns2. It connects the network entities and link in vertices and edges. Different network such as social network, biological network and technological networks are mixed to form a complex network. We integrate an optical fiber network and wireless network develop a radio over fiber network (ROF). IT transmits radio waves by optical fiber cables to ensure a network. 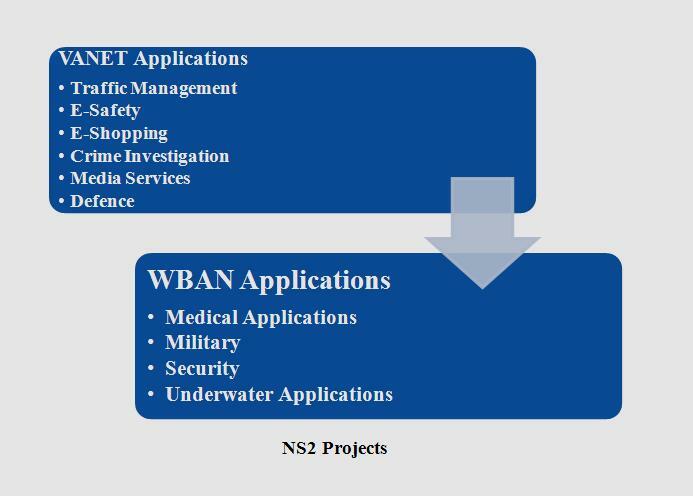 The idea behind to implement NS2 for radio over fiber network are dynamic channel assignment, remote demodulation and microcellular radio activities. Implementation of this network idea is to ensure an increase number of remote location on cellular devices. Dualsim phone capture various network location and perform services based on geographical locations. It deployed in various devices and application such as Remote control devices, voice and video conferencing, security alarm devices. 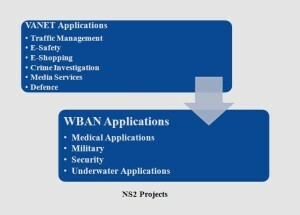 To perform vehicle to vehicle communication we implement vehicular ad hoc network in NS2 projects. It deployed in ns2 to track speed and distance of vehicle and to enhance road surveillance. To analyze and understand human body activities we implement wireless body area network in NS2. Devices are used to monitor temperature, glucose, heart beat level of human body. Using sensor nodes in wireless body area network various performances are monitored and measured. Wavelength Division multiplexing is an important method in optical communication networks. It operate every requirement as electronic rate we can easily implement a WDM devices because it process every devices as electronic speed. We deploy this network in NS2 to improve and performance and to solve a traffic routing.